Foothill Ranch, Calif. – Kawasaki Motors Corp., U.S.A. is excited to announce the Good Times™ Demo Tour is hitting the road in 2019. Demo events will take place nearly every weekend of the year at select locations and industry events. 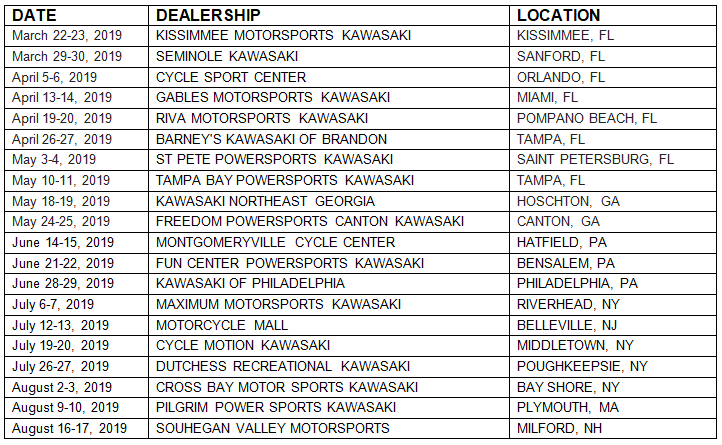 The Good Times™ Demo Tour lineup consists of 14 Kawasaki motorcycles for consumers to experience, with models from the Ninja family of sport bikes, Versys® adventure/touring line, Vulcan® sport cruiser line, and the full Z line of naked bikes, including a retro sport model Z900RS. Select locations will also include a Z125 PRO parking lot demo course, where licensed riders can feel the nimble nature of the Z125 PRO in a closed course environment. Participants will have the opportunity to ride several different motorcycles throughout the day; during the 15-20 minute ride sessions. There will also be live entertainment and free prizes given out throughout the day in the lounge area. In order to be eligible to demo a motorcycle, consumers will need to show their drivers license with motorcycle endorsement, pass a breathalyzer test, and wear appropriate riding gear; which consists of closed toe shoes, pants, riding jacket, gloves, and a helmet (loaner gear is available). The Good Times™ Demo Tour will run through 2019, with additional stops added throughout the year. To stay up to date on the latest information, upcoming dates, and locations please visit: https://www.kawasaki.com/Experience/Events.